After nearly 9 years on the market, Smart Tweezers have become a highly sought after tool for testing and troubleshooting electronics with Surface Mount Technology (SMT) used by many high-tech companies worldwide. Even with worldwide recognition, calibration for Smart Tweezers is only available in North America and India, creating hassle for companies that require annual calibration and/or calibration verification of their test equipment in order to be ISO compliant. Without proper calibration facilities, users must seek out alternate calibration techniques such as third party calibrations. Unfortunately, third party calibration is not true calibration but just a verification of accuracy by comparison of measurement accuracy with the actual values of high-precision components. This “calibration” may be common practice, but does not ensure that Smart Tweezers are working at optimal performance. The Smart Tweezers’ Calibration Fixture is a semi-automatic device that updates the calibration coefficients stored in EEPROM of every Smart Tweezers unit. The update is based on comparing the results of measurements obtained using Smart Tweezers with values of a few high-accuracy components called “the standard components”. The calibration coefficients are eventually adjusted by finding the best fit to the values of the standard components ensuring optimal performance of Smart Tweezers. Currently, there are only 3 of these calibration facilities worldwide; Waterloo, Ontario, Canada, Pasadena California, and New Delhi, India. This makes for a lengthy and costly procedure for European companies that use Smart Tweezers, having to send the devices to North America or India, or they use the third party calibration technique. Shipping, handling customs, etc. may not be time or cost effective. To simplify the process for European users, Siborg Systems Inc. (Canada) and Bokar International (USA) have joined together to establish a new facility at Production Solutions in Poland. Production Solutions has serviced Bokar’s SMT and ESD products for years, and is the first company in Poland to provide Polish and Central European electronic industries with the highest world-class equipment and products for SMT production, rework and repair. An agreement between Siborg Systems and CF Technology Sdn Bhd in Selangor, Malaysia have brought the popular device to South Eastern Asia. CF Technology was established in 1995 as CFS Technology. They are a specialist in automation systems, electrical and electronic equipment, machine spare parts (AI, SMT and AOI), industrial supply (ESD-safe equipment) repair and reconditioning of AI and SMT display boards. A new website has been released for Smart Tweezers by Siborg Systems Inc. featuring new instructional materials and useful tips for the newest model, the ST5, in Chinese. Manufactured in Canada, Smart Tweezers are gaining popularity in Taiwan, a well known hub for electronic manufacturing. Smart Tweezers are an essential tool when working with electronics using Surface Mount Technology. They feature automatic Resistance and and Capacitance measurements, as well as Inductance measurements which other similar devices do not offer. They are an indispensable tool for use in radio electronics with the ability to measure for Inductance to a fraction of microhenry. 7F, No 516, Sec. 1, Nei Hu Road, Taipei 114, Taiwan, R.O.C. No.16, JinShui Street, Hsin Chu, Taiwan, R.O.C. Siborg Systems Inc. and Pennsylvania based Bokar International have agreed to work together to bring Smart Tweezers to the USA, Canada and 25 other countries worldwide on 5 continents. Bokar International produces and sells innovative tools and equipment for reworking, repairing and assembling Surface Mount Technology (SMT), including a full line of equipment and accessories, and are continuously developing new, more sophisticated machines. Smart Tweezers are an industry proven tool, indispensable for SMT component sorting, on-board impedance testing and PCB debugging. For a limited time, Bokar International is offering an introductory sales price for Smart Tweezers ST5. Siborg Systems Inc. and Advance Tech Services in New Delhi have launched a new website for Smart Tweezers for Indian users. Advance Tech is offering an introductory sales price for the ST5 model. Smart Tweezers are now offered in India thanks to an agreement between Siborg Systems Inc. and Advance Tech Services Pvt. Ltd. in New Delhi. Advance Tech Services is a leading supplier of tools, equipment and consumables for the electronics industry, including maintenance. They also have an online store providing electronics for the automotive and process industries. Advance Tech believes that Smart Tweezers will be well welcomed to the electronics industry, providing a simple and easy to use solution to testing and troubleshooting electronics such as mobile phones, personal computers, tablets, etc. Siborg Systems Inc. and Maryland based SIBBIS International LLC have joined efforts to market the device in the United States. SIBBIS International is a specialist in international marketing of high-tech hardware and software, focusing on medical equipment and associated tools. What’s New on the ST5 model? The newest version of Smart Tweezers, the ST5 has been released. Still the same fully automatic LCR meter, Smart Tweezers still offers features like manual and automatic Inductance, Resistance, and Capacitance measurements, and diode and continuity testing, with just a touch of the tweezer tips. 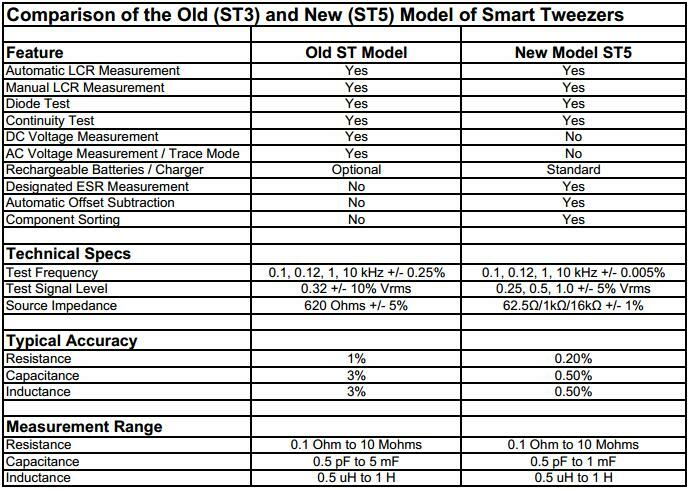 So what’s new on Smart Tweezers ST5? The new ST5 features designated Equivalent Series Resistance (ESR) measurements. When measuring for a capacitance, the unit measures for secondary parameters such as the ESR. This value is displayed in the secondary display. Semi-automatic offset subtraction that allows a value of parasitic resistance to be automatically subtracted from the measurement value of the component under test. A higher basic accuracy of 0.2% is an estimated 6 times higher than older models, this accuracy is usually only available with expensive bench-type testing. A Li-Ion battery replaces the hearing aid batteries in the old models, with a USB charger, significantly increasing the battery life. Smart Tweezers has also gotten a slight physical upgrade with the replacement of the jog-wheel. This navigational device used to be situated on the side of the device and allowed users to change the settings with back-and-forth movement as well as a push button to select. The new ST5 features a joy-stick like navigation on the front of the device, providing a more comfortable experience. Other than the removal of DC/AC voltage measurements, Smart Tweezers are the same renowned LCR meters but with higher accuracy, even more features and an updated look. Why Would I Need an Extra Pair of Smart Tweezers’ Tips? The tips are made of gold plated stainless steel and the gold tends to wear out with time. Apparently the wear out mostly depends on the number of touches and the quality of surfaces that are touched. A rough estimate with a moderate intensity of Smart Tweezers’ use would be 2-3 years. Typical contact resistance of the Smart Tweezers Tips is about 20 mOhms. It can be as high as 1 Ohm for a heavily used Smart Tweezers.